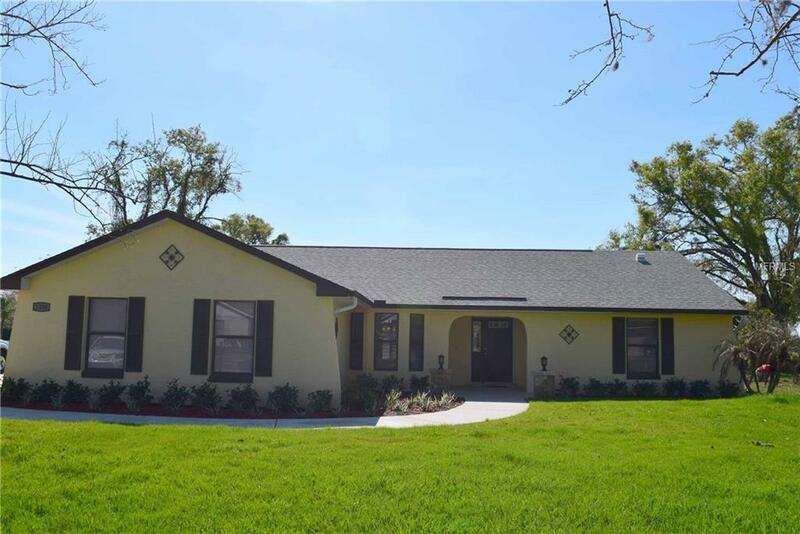 "TOTALLY UPDATED 3-BED, 2-BATH HOME IN ERROL ESTATE GOLF COMMUNITY, APOPKA, FL 32712. This move-in ready home has been totally upgraded & available for a quick closing. With a split-plan design, the home offers vaulted ceilings & a spacious feel. The kitchen is gorgeous with new 36 Chestnut cabinets, granite counter-tops, pantry, Whirlpool stainless steel appliance pkg, 20"x20" ceramic tile floors, dinette w/bay window, stainless-steel sink w/goose-neck faucet, new light fixtures & brushed nickel hardware. The living & dining rooms are open with fresh paint, laminate floors, ceiling fan, blinds, light fixtures & a natural stone wood burning fireplace. Addl features: large master bdrm, walk-in closet, plush carpeting, fresh paint, ceiling fan/light kit & blinds. Master bath w/dual-vanities + make-up vanity, Chestnut cabinets, granite, new sinks/faucets, lights, walk-in shower, new floor-to-ceiling tile. Both addl bdrms have new carpeting, paint, closet doors, ceiling fans/light kits. Hall bath has a "European style wall-mounted cabinet, custom sink, soft-close drawers, new bathtub & toilet, new floor & wall tile & fresh paint. Inside laundry room w/new paint, tile floor, wash tub, fixtures & shelving. More "new: water-heater, ceiling fans/light kits, 6-panel doors, hardware, switches & plates, full size garage w/epoxy-coated floor, door opener, gutters/downspouts, oversized yard, fresh landscaping, irrigation system, low taxes, low HOA fee & more. Call for more info or to schedule a showing.